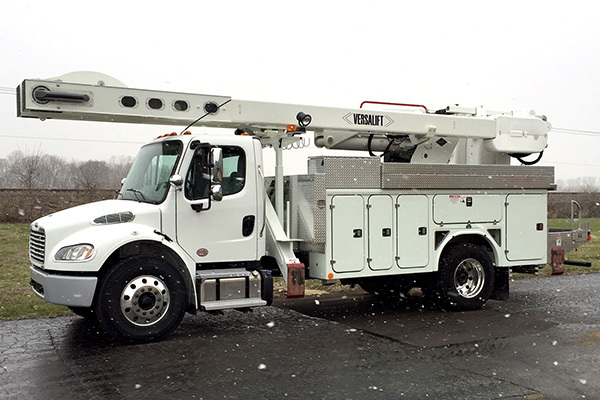 Versalift has a full line of articulated overcenter bucket trucks and aerial devices ranging in height from 36' to 65'. 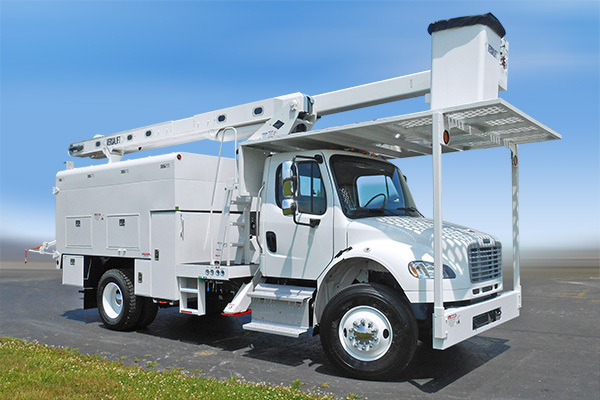 The products include forestry units with over 50' of horizontal reach and heavy duty material handlers for electric utility operations. All of these units are rugged and dependable. 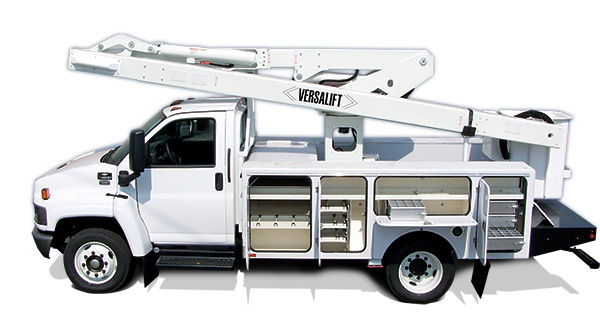 Versalift does not use any cables in these units for lower maintenance and better safety. The 8 in. x 10 in. (200 mm x 250 mm) rectangular upper boom is constructed of high strength filament-wound epoxy resin fiberglass. The fiberglass has a gel coat and a high gloss durable urethane finish for added weather protection and water beading. The lower boom is designed and constructed from high strength, 12 in. (300 mm) square, steel tube. Boom articulation is 1100, from horizontal to 200 past vertical. Rotation is continuous and unrestricted in either direction. The rotation system consists of a hydraulically driven worm and spur gear acting on a shear-ball rotation bearing. The critical bolts holding the lift to the rotation bearing and the rotation bearing to the pedestal are grade 8. Platform leveling is achieved automatically through a completely enclosed parallelogram system. The major components of this system include 1 in. (25 mm) diameter fiberglass leveling rods and No. 100 high strength roller chain. 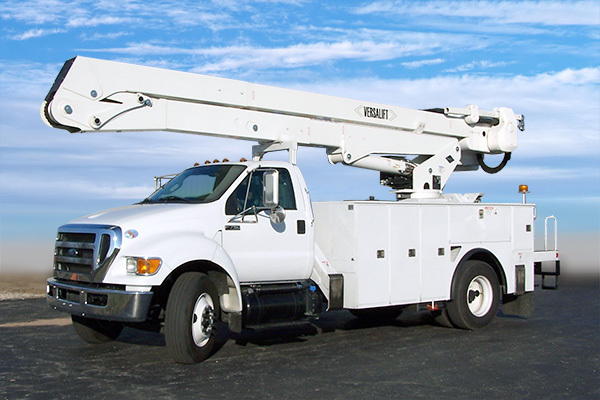 The Versalift VO-255/260 offers up to 65 feet of working height, 50 feet of side reach and up to 400 lbs of platform capacity, allowing you to reach higher and farther than ever before. Productivity is also increased because the amount of chassis setups that must be done in order to achieve the right positioning can be kept to a minimum. The overall versatility of the VO-255/260 makes it the premier equipment for the tree industry, providing users with the greatest reach capacities available on the market today. Safety is always our top priority, so every Versalift VO-255/260 is equipped with dual pin retention. This redundant safety feature provides the assurance that allpins stay securely in position. VO 255 and VO 260 forestry units can be built either as flatbed or chip box variations. 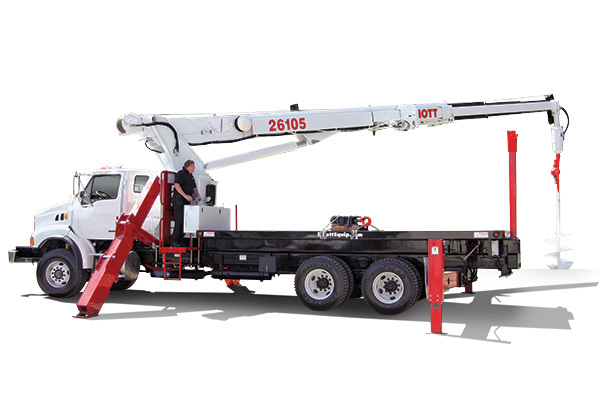 Booms have up to 270 degrees of articulation without the use of cables. Versalift uses non-lube bearings at all pivot joints. Only the rotation and leveling chains require periodic lubrication. 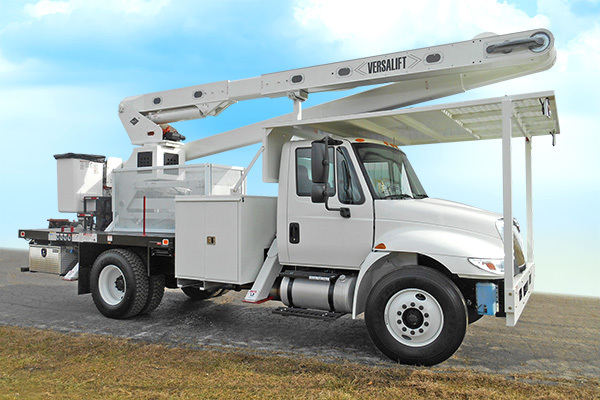 The VO270-E forestry package offers 75’ of working height, and can be mounted on a single axle cab and chassis. 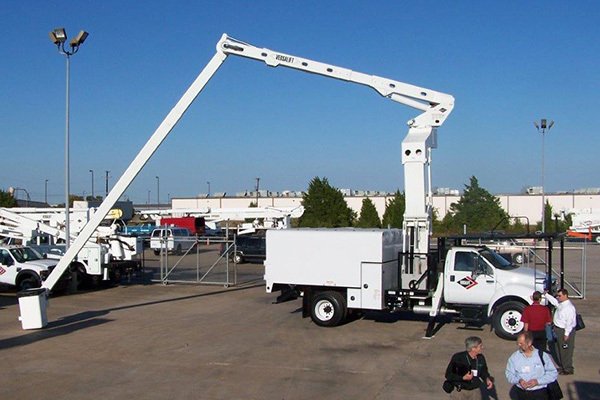 The 60’ overcenter boom is mounted on either a transverse or longitudinal elevator which can be raised or lowered for added height. These machines are typically built as either flatbed or chipbox units depending on owner preference. Includes a 3-Axis single handle controller with safety trigger, a locking lever for platform tilt, and controls for emergency stop, platform stow/unstow, platform rotation, and jib/winch operation. Also includes dual hydraulic tools with a 2000 psi reducing valve. Control valves are full pressure, full flow, manual type valves. The VO 350/355 is perhaps the best heavy duty material handling bucket truck available today. Side by side boom allows for very low travel height. Up to 2,000# of jib capacity and 60' of working height. Most any common optional item is available on the VO350 and 355. 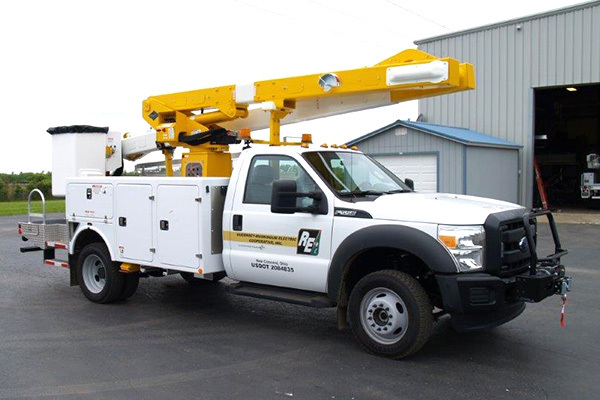 UTE uses a variety of chassis models for mounting new trucks, and we custom design our utility bodies to your specifications. Our sales force can guide you with the proper specifications.